Exporters find ways to export a wide variety of interesting goods and receive payment by a letter of credit. While reading the merchandise description, keep a sense of humor. This post is about an exporter who manufactures items used by farmers such as steel corral fences and swinging gates. He also manufactures brooder stoves. When a farmer buys baby chicks in early spring, it is cold outdoors. One-day-old chicks instinctively seek to gather under the mother hen's wings to keep warm. This mother hen is commonly referred to as a brooder hen. The brooder stove is a substitute for the brooder hen. By means of electricity or natural gas, it gives off heat, and chicks crowd under it for warmth. As the weather becomes warmer and the chicks grow bigger, the farmer raises the brooder stove off the floor by means of adjustable legs or with a rope hung from the rafters. This manufacturer received a letter of credit with the following merchandise description: "Brooder stoves for chickens without legs." Although the incorrect phrasing makes one smile, the bank will look for an invoice which accurately and correctly describes the merchandise as: "Brooder stoves for chickens without legs." What do the chicks have in common with cows that are 24 months pregnant? Only that they share the principle of strict compliance. Read on. Remember an earlier lesson about the trading company that sold 240 live Holstein cows to Korea and received a letter of credit for payment? After shipping the animals, they brought the documents in to the bank for examination and payment. One of my co-workers accepted the assigned task of examination. After a short while she came to my desk and asked, "Roy, you grew up on a farm, didn’t you? 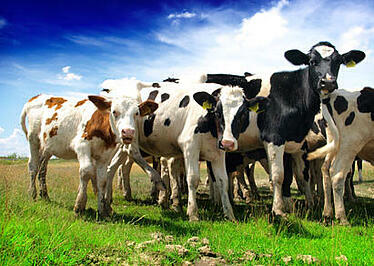 Can a cow be 24-months pregnant?" I replied, "No, the gestation period is nine months, just like a human." "Well," she said, "I have a letter of credit that says the cows must be 24-months pregnant." I grabbed the file out of her hands and said, "Let me see that!" Sure enough, the merchandise description read, "Holstein cows 24 months pregnant." With a little thought, it became obvious that it should have read, "Holstein cows 2-4 months pregnant." Or perhaps, "Holstein cows, 24 months old, and pregnant." But in keeping with the cornerstone of strict compliance, the bank accepted the invoice as, "Holstein cows 24 months pregnant."